FRAMINGHAM – For the first time since 1997, the Natick High girls swim & dive team defeated the Framingham High swim & dive team in a regular season meet. The meet was decided in the final of 12 events – the 400-yard relay. If the Flyers had finished first and second, they would win the meet. If Natick finished anything but third place, they would win the meet. Natick won the relay, and Framingham finished second and third in that relay. The Flyers lost to the Red Hawks Monday evening 96-90, in a meet that was postponed Friday night due to a thunder and lightning storm. It was the first time in head coach Mike Foley’s tenure that a meet was postponed due to lightning. The Flyers are now 9-3 on the season, after opening the season 5-0. Today, Oct. 25 is the final home meet of the season for the Framingham High girls swim & dive team. The Flyers will host Acton-Boxboro in a non-league meet at 4 p.m. at Keefe Technical’s pool. The Bay State Conference meet is Sunday at Wellesley College. The meet was 41-37 Framingham, after it was called due to the storm on Friday night. Framingham was ahead on the strength of its divers who finished 1-2-3. Junior Halia Bower won the diving competition, with senior Stephanie Fawell second and junior Catherine Turner third. Natick started off the meet Friday night strong, finishing 1-2 in the medley relay. Framingham finished third. Only the top three relays can earn points for a team. Natick’s Hannah Batt out touched Framingham’s Kara McCurdy in the 200-yard freestyle, on a judge’s decision. Batt won in 2:00.69 minutes, which qualifies her for the state meet. McCurdy also has qualified for the state meet. Framingham swimmers Bella Tersoni finished third and junior Julia Long fourth in that event. In the individual medley, Natick won, but Framingham had a “deep sweep” finishing second, third, and fourth to take that event 9 points to 7 points. Framingham freshman Tatum O’Leary finished second, junior Olivia Nelson third, and senior Alessandra Miranda was fourth. In the sprint event, Natick’s Sarah Doherty won in 26.50 seconds, which qualified her for the state meet. Freshman Marley DeSimone finished second for Framingham in 26.56 seconds, which also qualified her for the state meet. Freshmen Jillian O’Neil finished third and Jessica Tosi fifth in that event. 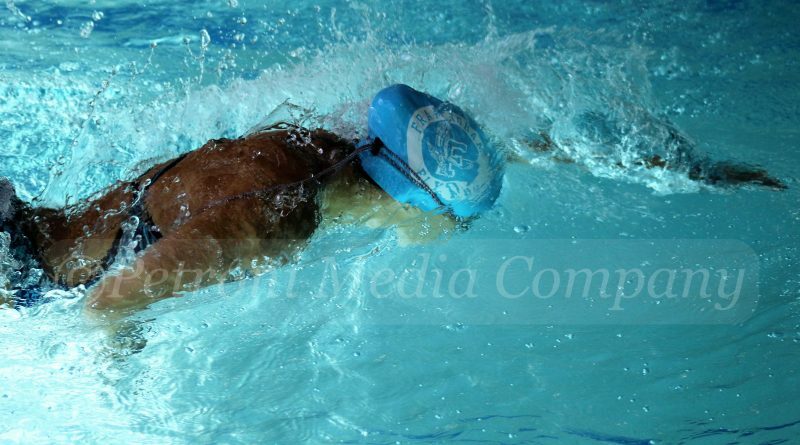 Junior McCurdy opened the Monday competition with a win the 100-yard butterfly for Framingham. Her time was 1:04.97 minutes, which qualifies her to compete in the state meet. Natick’s Rose Arena finished second in 1:05.67 minutes. DeSimone finished second in the 100-yard freestyle for Framingham. Freshman Caroline Mazariegos finished fifth for the Flyers. Natick’s Batt won the 500-yard freestyle event. Framingham again had a deep sweep finishing second, third, and fourth. Tersoni finished second, Long third, and O’Leary fourth for the Flyers. After that event Framingham was ahead 66-60 in the meet. Natick won the 200-yard freestyle relay. Framingham swimmers DeSimone, Tersoni, Miranda and McCurdy finished second. The score was tied 70-70 after that relay, with three events in the meet to go. Natick’s Abby Chen won the 100-yard backstroke in 1:06.14 minutes, which qualified her for the state meet. Freshman Laryssa Gazda finished second for Framingham in a time of 1:06.71, which also qualifies her for the state meet. Framingham’s Olivia Nelson finished fourth in a time of 1:07.53, with Mazariegos fifth for the Flyers. But Natick’s 1-3 finish in the backstroke, gave the Red Hawks a 79-77, a lead they never relinquished. Natick’s Delaney Conway won the 100-yard breaststroke event in 1:15.82 minutes. Framingham’s Miranda finished second in 1:16.34. Framingham Tosi took fourth and sophomore Emily Rogers finished fifth. Natick had an 86-84 lead, headed into the finale event of the night,the 400-yard freestyle relay. Natick won the relay to secure the win. Framingham finished second and third in the relay. If Framingham had finished first and second, the Flyers would have won the meet. On the second place relay team was DeSimone, Tersoni, Mazariegos and McCurdy. Flyers Suzanne Julakis, O’Leary, Katherine Castro and Tosi finished third, eight seconds ahead of the fourth place relay team. The annual Framingham vs Natick swim meet between the two girls teams is also the night both teams honor their seniors.